It is a CharmCatcher by Christy Lea Payne... you purchase the CharmCatcher (they offer it on leather or sterling chain) and whatever charms (birthstone, letter or words) you want to add separately. My plan is to order two things to use with it. 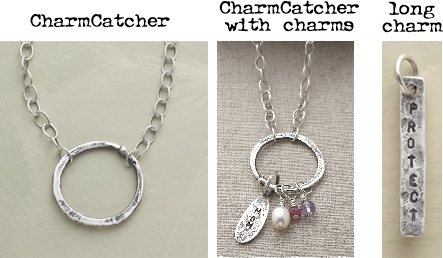 One is a Disk (that I saw on this post) from Beth with my entire Style Statement on it (Nostalgic Creativity) and the other is to have 2 long skinny hand stamped charmed each with one word form my statement custom made by the jewelry artist herself. Then, for the other charms I will use vintage bits that I have stored up waiting for their chance to shine (i have to beg help on wire wrapping them from this dear friend) I have at home and I can mix and match as my mood dictates. I am trying to get Kari to get one too since she knows her Style Statement now too (click here to see what it is)! Once all the elements arrive I will share how it looks with you! But you can get some pretty nice pre-made charms at The Sundance Catalog too if you want to put together your own version now! Tomorrow will be a preview of journal pages before I have written on them... and Saturday or Monday my journal check in! So stay tuned.